WALDBÜTTELBRUNN, GERMANY – LED spotlights with seven colors in one LED and compact design: That’s what Eurolite presented at Prolight+Sound 2019 with the 7C Silent Slim Spots. The built-in LEDs include the colors RGBA/CW/WW + UV. The 7C spotlights thus offer absolute freedom in terms of color design – and that with a space-saving design. Ideal for stages and clubs! 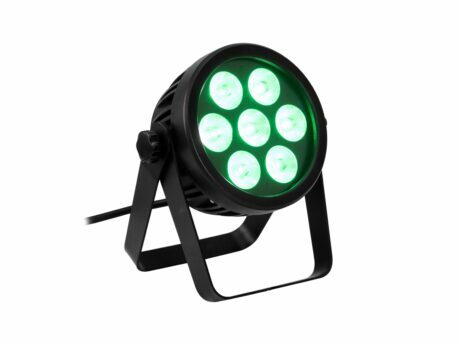 Currently, two spots are available in the series, each equipped with 7 or 12 nine-watt LEDs (7in1). 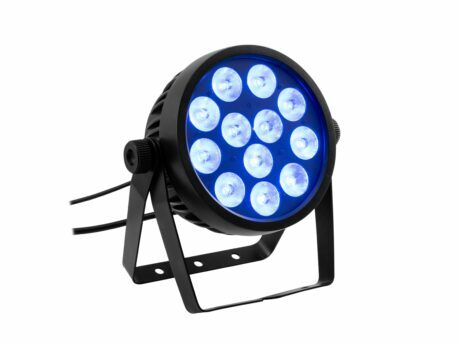 Each LED contains the colors red, green, blue, amber, cold white, warm white and UV. For white light, the color temperature is adjustable from 2700k-8000k in 6 steps with an excellent CRI value. The direct color selection of 27 mixed colors is also possible. This makes the spot not only a good choice for stages, but also for clubs. Both models do not require a fan, and thanks to their convection cooling, they convince with noiseless operation. The space-saving design of their sturdy housing makes the spotlights flexible to use. With the swiveling mounting bracket and an additional set-up bracket, they are prepared both for mounting in the trussing and for operation on the ground. The power connection is made via a P-Con input and the power supply can be looped through for up to 8 devices. A USB socket is available for wireless transmission of the DMX signal. A wireless Quick DMX receiver can be plugged into this socket. Addressing and settings can also be made directly on the device or via a normal DMX controller.